So Jacob’s mother packs him off to go to her brother’s house “for a few days” which turns out to be 14 years. 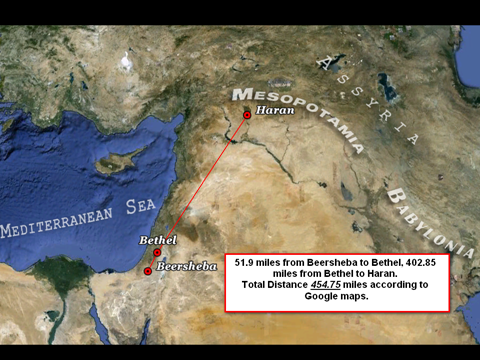 Jacob – being from the middle east – was on an Arabian horse. As evening of the first day falls, Jacob finds himself near the city of Luz. He knows the city gates will close at sundown therefore he is content to spend the night in the open field, “and he took one of the stones of that place and put it at his head, and he lay down in that place to sleep” (vs. 10 NKJV). Its clear to see that Jacob feared for his life. In THAT PLACE you desire comfort but comfort is denied. But there are plenty of rocks. In THAT PLACE you desire companionship but companionship is denied. Still, there are plenty of rocks. In THAT PLACE you could use a friendly voice, an understanding voice, but friendly and understanding do not exist here. Rocks exist here, and plenty of them. If you are going through a hard time, know that God is near you. I have found that in the hard times, this is where I most meet God. Ps. 61:2 From the end of the earth will I cry unto thee, when my heart is overwhelmed: lead me to the rock that is higher than I. See when our heart is overwhelmed because things are going wrong in our world, we need to not let our emotions make decision, but rather get our thinking right by aligning it with the word of God. 2Do not be conformed to this world (this age), [fashioned after and adapted to its external, superficial customs], but be transformed (changed) by the [entire] renewal of your mind [by its new ideals and its new attitude], so that you may prove [for yourselves] what is the good and acceptable and perfect will of God, even the thing which is good and acceptable and perfect [in His sight for you]. She was running from a fat man selling salvation – in his haaand. Now he’s trying to save me – well I’m doing all right – the best that I can. Just another fallen angel – trying to get through the night. Step by step – rung by rung – I’m climbing Jacob’s ladder. Sing along – send some money – Join the chosen few. And all I want from tomorrow – is to get it better than today. Step by step – rung by rung – I’m climbing Jacob’s ladder . Scholars sometimes contrast Jacob’s ladder, God’s outreach from heaven to earth, with the Tower of Babel, man’s grasping from earth toward heaven. Are you trying to climb to heaven on a “ladder” of your own good works and behavior, or are you taking the “ladder” of God’s plan of salvation, his Son Jesus Christ? Interesting that people still want in their own efforts to get to heaven – rather than resting on the Christ – who is the outreach of heaven. A ladder takes you to the next level. Jacob needed a ladder. On his own, he was unable to bridge the gap between the human and the Divine. As a scoundrel, liar, and cheat, he was not able to enter into clear and constant communion with God. He was isolated on the desert floor, without hope of divine guidance in his life. 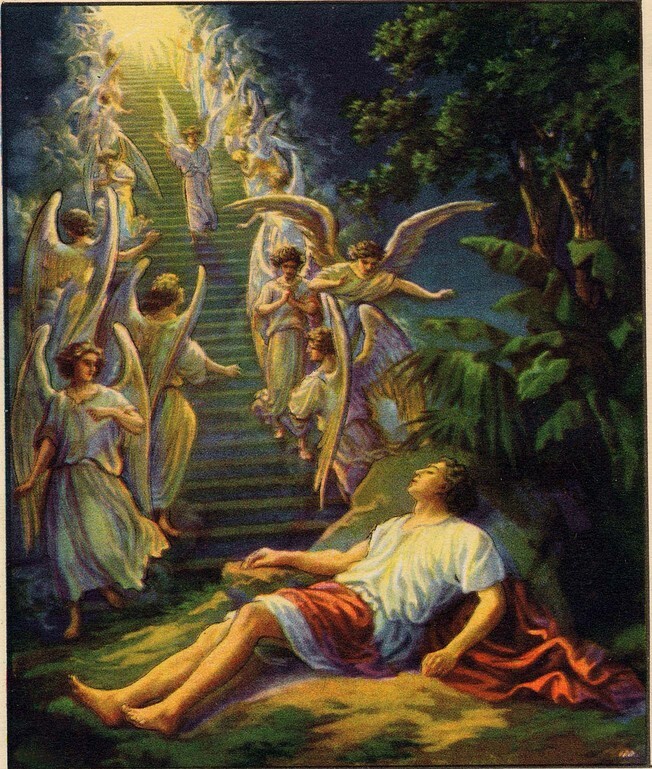 Yet, precisely at his point of need, Jacob has a strange dream, consisting of a ladder, angels ascending and descending the ladder, and God’s voice speaking forth from heaven. His future is looking bleak. Maybe as you read this you need to know that God is beginning to speak into your future. Unless a grain of wheat falls into the ground and dies – it cannot bring forth life. But it is up to us on how we react to the tough seasons of our life. He learned via the vision of a ladder that communication between heaven and earth was possible. Angels ascending and descending between heaven and earth shows him that God’s “messengers” are plying God’s business constantly. But, to me, this is the best part: “And, behold, the LORD stood above it, and said, I am the LORD God . . . I am with thee, and will keep thee in all places whither thou goest…I will not leave thee, until I have done that which I have spoken to thee of” (Gen 28:12-15 KJV). 2. He is “the LORD God.” He is the Ruler of everything. There is no match to his power and might to save. May we “awake” from our complaining. May we “awake” from our whining. May we “awake” from feeling sorry for ourselves. May we awake from making excuses. May we “awake” from blaming others. May we “awake” to a full awareness of God’s promise, provision and presence! In the hard times – we have to challenge ourselves about what we say. What is the vocabulary of our life. Often in hard times, the words we speak become very negative. God is in the hard times – But we so often don’t know it. Most scholars assume that the town Luz was named Almond Tree because the almonds that grew in its environs. There is no proof of that, however, and Luz may very well have been named after a “crooked and perverse generation” that lived there. Hard times are an opportunity to deviate from the will of God or an opportunity to deviate toward the will of God. From the plan that God has for your life. But we can turn these opportunities for deviation into a gateway into heaven. Olive oil has been a staple food in the Mediterranean for thousands of years, and some olive trees which are hundreds of years old still bear fruit. The process for making olive oil is relatively simple,. The olive harvest is the first step in making olive oil. Traditionally, olive trees were beaten by hand to release the fruit, Once the olives have been picked, the clock starts ticking: they must be brought to an olive mill as soon as possible, or the acidity level will climb too high, ultimately affecting the flavor. After being brought to the mill, the olives are picked through to remove large branches and leaves, and then sent through a cleaner which removes dirt, leaves, and twigs, leaving plain olives behind. The cleaned olives are run through a mill which turns them into a paste. Traditionally made olive oil still uses a stone grinder to mill olives,. The resulting paste is subjected to the malaxation process, which means that it is slowly mixed so that droplets of oil begin to adhere to other droplets in the mixture. As we processed through life – the result of our life – if we allow the supernatural around our life – is that we will be oil for the use by the master. Toxic in the way we do life. I want to be like extra virgin olive oil. Notice too what it is that the Lord says, “I am the Lord the God of your father Abraham and the God of Isaac…” Notice that He is not yet Jacob’s God, but He is about to be when we get down to verse 21 (Gen 28:21). 12) He then commits himself to God and commits to giving God a tenth of all he will possess in his lifetime.